EDR GIS Division Attends Annual Conference - Environmental Design & Research, Landscape Architecture, Engineering, & Environmental Services, D.P.C.Environmental Design & Research, Landscape Architecture, Engineering, & Environmental Services, D.P.C. The EDR GIS team recently attended the 28th Annual GIS/SIG Conference. The conference covered a variety of topics including applications of GIS in field data collection, planning, web mapping, stormwater management, and more; a discussion of new and improved ESRI software products; and featured a keynote address by Daniel Cole, the GIS Coordinator and Chief Cartographer of the Smithsonian Institute. 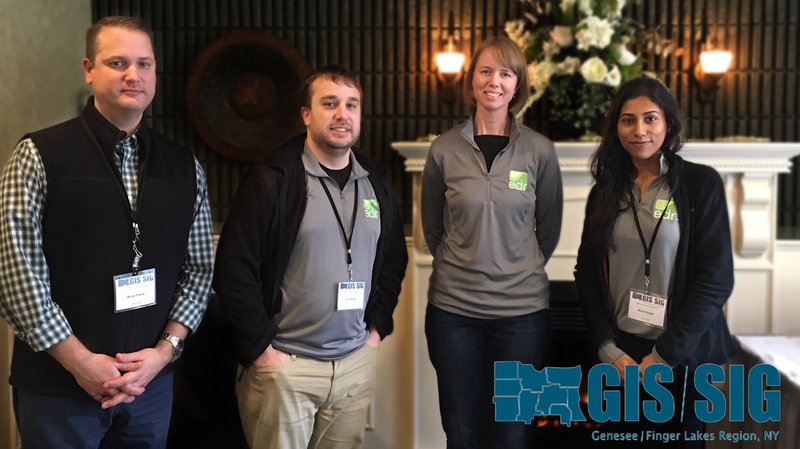 The Genesee Finger Lakes region chapter of the Geographic Information Sharing Special Interest Group (GIS/SIG) is an educational user’s group whose primary mission is to foster the understanding of Geographical Information Systems (GIS) technology. EDR recently established a formal GIS Division, who provide stand-alone GIS services as well as internal support to each of EDR’s disciplines. GIS-based data collection, management, analysis, and cartography are integral tools for all of EDR’s environmental permitting, cultural resources, visualization, planning, and site design projects.